ISLAMABAD: Despite expanding the withholding tax to cover every imaginable transaction, top 10 contributors to the tax have remained unchanged for the past five years while about two-dozen areas have contributed paltry sums – far less than Rs500 million – in the first six months of 2017-18. The numbers for July-December of the current fiscal year put a question mark over the strategy of documenting the economy by charging high withholding tax from those who opt to remain outside the tax net. Some of the new areas on which withholding tax has been imposed do not even fall among the top 20 contributors. However, the growing share of withholding tax in total collection on the back of higher tax rates has made tax authorities and the political leadership complacent, diverting attention away from core problems in the tax machinery. When the PML-N government came to power in June 2013, it had announced that it would tackle the extremely narrow tax base by enforcing two tax rates for the filers and non-filers of income tax returns. In line with the policy, it has increased the number of withholding tax in the past five budgets to around 74 in addition to multiplying the tax rates. Resultantly, the share of withholding tax in total tax collection, which was 56% in June 2013, has now gone up to over 70% in a span of just four and a half years. But the top 10 contributors have remained unchanged. In 2013, the top 10 contributors had accounted for 93% of the total income tax collection. Later, in July-December of FY18, they contributed 86% or Rs426.6 billion out of the Rs491-billion income tax collection. The top 10 areas are contracts, imports, salary, telephone bills, exports, bank interests, cash withdrawal, dividends, technical fee and electricity bills. There are different rates for one type of tax and for this story 48 types of taxes are being considered. The government had targeted hotels, clubs, marriage halls, restaurants, foreign-based films, dramas, dealers’ commission, educational institutions, wholesalers and retailers, realty sector and banking transactions to expand the tax base. 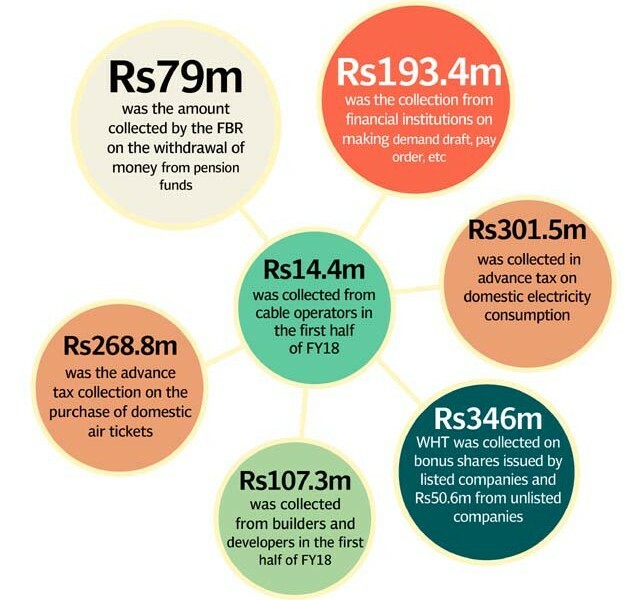 Four and a half years are gone, the withholding tax on almost all these areas has remained largely unproductive as not only the tax base has been stagnant, but its contribution is negligible except in the case of banking transactions that contributed Rs8.2 billion in the first half, but it was not among the top 10. The Federal Board of Revenue (FBR) collected only Rs79 million on the withdrawal of money from pension funds. Tax collection from financial institutions on making demand draft, pay order, etc was only Rs193.4 million. The advance tax on domestic electricity consumption generated a mere Rs301.5 million whereas just Rs332.6 million could be collected from steel melters and re-rollers. Advance tax collection on the purchase of domestic air tickets was a meagre Rs268.8 million and on the purchase of international air tickets it amounted to just Rs511.6 million in July-December FY18. One of the key tax broadening measures announced by the PML-N government in 2013 was the withholding tax on functions and gatherings. However, in the first half of FY18, the collection was a mere Rs436.5 million. In the case of foreign film production, the FBR collected only Rs1.5 million. Cable operators paid a meagre Rs14.4 million in the first half. Withholding tax on dealers commission could generate a mere Rs38 million. Another controversial measure was the withholding tax on bonus shares issued by the companies. But its collection in the first half was only Rs346 million from the companies listed on the stock exchange and Rs50.6 million from unlisted companies. Builders and developers paid a paltry Rs107.3 million in the first half of FY18. Non-resident Pakistanis paid just Rs263.8 million while no collection was made under the head of payments to non-media persons. The collection on payments to non-residents for the use of machinery was Rs241.2 million, on dividends Rs19.8 million, from the Pakistan Mercantile Exchange Rs100,000, on insurance premium Rs211.7 million and on minerals extraction Rs180,000. As was the case five years ago, the major revenue spinners have stayed unchanged. The top withholding tax spinner was contracts that contributed Rs127 billion or roughly 30% of the total withholding tax collection in the first half. At the import stage, the FBR collected Rs104.8 billion worth of withholding tax – or one-fourth of the total withholding tax collection. Salaried people contributed Rs57.8 billion or 13.6% of the total in the first half. The tax on dividends contributed Rs30.8 billion, telephone bills Rs25.1 billion, bank interests and securities Rs22.3 billion, electricity bills Rs16.6 billion, cash withdrawals Rs15.9 billion, exports Rs13.4 billion and technical fee Rs12.9 billion. The most controversial 0.4% withholding tax on banking transactions was not among the top 10 contributors as the collection stood at only Rs8.2 billion in the first half. Published in The Express Tribune, February 6th, 2018.